The Jefferson Citywide Rummage Sale is closely approaching. Don’t forget to fill out your registration form to get your ad listed in the Daily Union. The registration fee includes your rummage sale ad published in the Daily Union the Thursday and Friday prior to the sale on May 2-3, as well as a garage sale kit (three weather-resistant signs, price stickers, inventory sheet, and tip sheet on how to hold a successful rummage sale). The garage sale kit is available for pick up at the Daily Union office and the Jefferson Chamber office. Please make all checks payable to the Daily Jefferson County Union. Credit cards also accepted. Drop off or mail registration form and $20 fee to the Daily Union by Friday, April, 26. Communities, Community, Jefferson Rummage Sales. 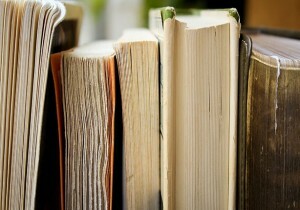 Find used books, CDs, and DVDs at the Used Book Sale at Jefferson Public Library. 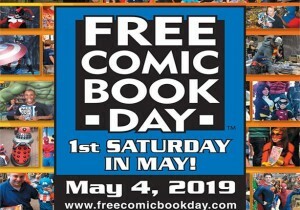 Celebrate Comic Book Day by picking up free comic books at the Johnson Creek Public Library! 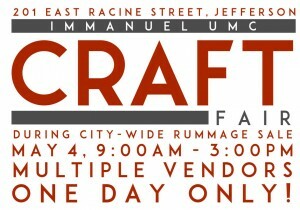 Immanuel UMC will be hosting a Craft Fair on May 4 during the city-wide rummage sale. There will be multiple vendors there from 9am until 3pm. Don’t miss out! Madison Classics Car Show and Swap Meet, Annual Book Sale, Rummage-o-Rama and Mary Hoard Art Show all in Jefferson County Wisconsin!